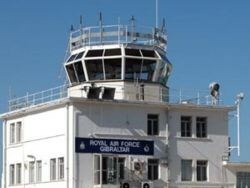 Royal Air Force Station Gibraltar, better known as RAF Gibraltar and formally as North Front, is a Royal Air Force station on Gibraltar. No military aircraft are currently stationed there, but there are regular visits. The station functions as the Rock’s civilian airport, Gibraltar Airport, and is administered by British Forces Gibraltar. The biggest expansion took place during World War II when the runway length was increased using waste rock blasted from the tunnels of Gibraltar. At this time the airfield completely obliterated the former Gibraltar racecourse. The airfield played a major part in Operation Torch, the Anglo-American invasion of French North Africa during World War II. The airfield, which today is used mainly for civil flights, is unusual in that the main access road from Gibraltar to Spain crosses the airfield, necessitating the road to be closed whenever aircraft movements are in progress. When the RAF holds an exercise, this causes significant disruption to traffic flow. RAF Gibraltar used to have an Avro Vulcan K2 as a gate guard, but this was later scrapped. Are there anyone out there that were with me in signals in Gib. A small gang of us would go over to La Linea when the gap was open. I also spent my leisure time as a presenter and producer on he camp radio. Memory is going now, like the rest of my body. Some of the names I remeber are Taf, I never did know his real name, Babs, Dave, Maggie and so on. From there I was posted to RAF Stanbidge. I ran the radio station there and presented a film based programme includng interviews wih several stars. Hello, Are there any members of the Sunday evening Diners Club about?? Jim Pickford,Mac, Phil.etc. I have still got my tie,have you? Serving with 224 Squadron from 53-55 Remember when we had a large navy, 4 Aircaft carriers launching an attack on Gib at around 0600 one morning. Eagle, Indomitable, Bulwark and Indefatigable. The aircraft in those days were, Seahawks, Attackers, Avengers, Skyraiders, Wyverns and Gannets. Anyone out there remember such days? Also remember Empire Windrush going down and all the survivors sharing our billets until squadrons of Hastings and varied transports came in to take them all back to the UK. Does anyone remember a Lancaster doing training of 'Circuits and Bumps' on the airfield when it did a turn over 'No Man's Land', the cross wind caught it and it crashed in the area between Spain and Gib. several airmen were killed including the trainee pilot. The trainer pilot was a Polish Officer, who, it was reported had to be restrained in La Linea jail because he was trying to rescue his personnel and was endangering his own life. The rescue teams could not get to the plane because of the soft ground. I had just come off duty at the tower and was walking back to New Camp when we heard the commotion, looked back and saw the smoke from the aircraft, we ran to see if we could help but was held back.